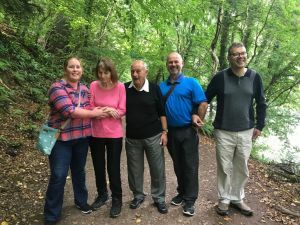 Several residents from across the group enjoyed another annual holiday to Ross-on-Wye this year. This time away from the home is invaluable to those residents suffering with dementia. They can reap the benefits of fresh air, a change in scenery and the reminiscence of past holidays. Residents enjoyed walks to Symonds Yat, swimming, hotel entertainment and much more. Physical activities are proven to have a significant impact on the well being of people with dementia, and there was a 3 course meal waiting at the hotel each evening to compensate for all that exercise! The week long holiday offered a person centred approach, aiming to meet the needs of each individual. Whilst some residents enjoyed the gardens of the hotel and the hotel entertainment, others preferred to take full advantage of the trips and activities in the local areas. We hope this holiday break helps residents to gain further confidence and independence by making decisions outside the care home setting. We’d also like to take this opportunity to thank the staff who volunteered to support the residents on holiday this year.